We went rustic for a while – barns, raw wood benches, burlap, baby's breath and chipping paint – but now the wheels are turning again, and brides will be going for more industrial style spaces and pieces. 2019 will refine rustic to an industrial elegance, which means that barn weddings will be outranked by raw metallic spaces like refurbished factories and old warehouse-style buildings. This trend will also include more raw metal and exposed brick and concrete in decor. It’s out with the gold and in with the new; copper, bronze, chrome and silver will replace the gold and rose gold accents of 2018. Old meets new and country meets city with industrial updating rustic and redirecting next year’s wedding trends. 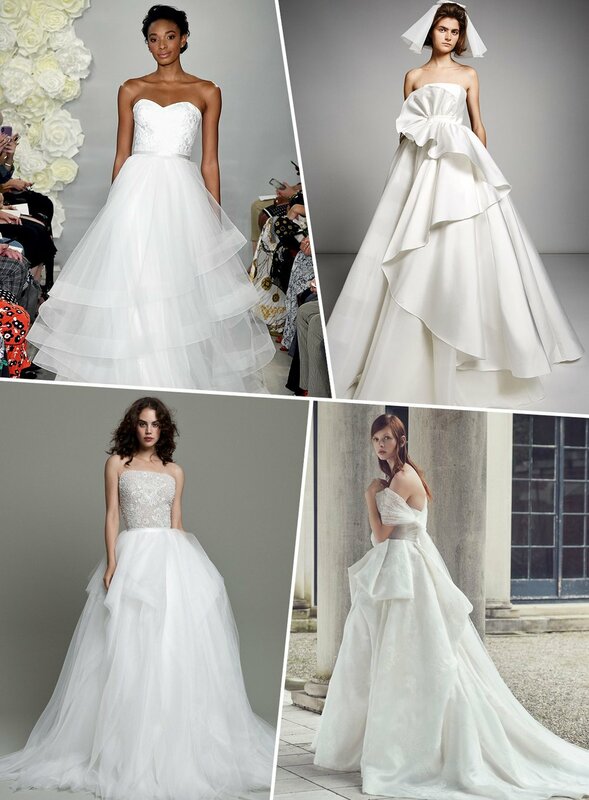 Straightforward ball gowns still (and will always) have a place in bridal, but the biggest skirts on the fall 2019 runways had an extra hint of volume, thanks to asymmetric tiers of tulle and satin that gave them the rippling effect of a waterfall. From Theia to Hayley Paige, these dresses are perfect for making an entrance. Greenery has been adorning weddings for several years, and often it is used in lieu of flowers or with minimal floral accents. This year, say goodbye to pale accent flowers and grab a bright bouquet. Flowers are in and they are gonna be big! From sunflowers to peonies and dahlias, 2019 flowers will be bigger and brighter than before, and while the greenery garlands are here to stay, they will be coexisting with these large, bright blooms. Yay! You’re engaged and now you’re drowning in options for your wedding. Here are a few local wedding expos happening this year to help you and your partner pick the best options for your wedding. This expo will have a plethora of live bands and DJ demos throughout the day as well as many wedding professionals there to help you with all of your wedding needs. The Forever Bridal Wedding Show & Expo, on August 10th & 11th, will showcase the Triangle area’s top wedding vendors that are ready to help plan your dream wedding. As with every Forever Bridal Productions show, the August Wedding Show & Expo features fashion shows with the newest styles for your special day. You might just spot your dream dress or the perfect suit for your handsome husband-to-be. Christmas time is an extremely popular time of year for people to get married, and if you’re going to a bridal shower or wedding reception, consider some of these particularly unique Christmas wedding gift ideas that are a twist on the original ones most people buy. One of the loveliest and most unique Christmas wedding gift ideas I’ve seen so far involves buying the bride and groom especially nice embroidered stockings, made of fine material like silk. Have their initials or just their last name’s first initial on the stocking, in a big, pretty design. If you’d like to help the new couple celebrate their first Christmas together, buy them champagne glasses. Have either their wedding date placed on them, or a nice saying such as the year with “First Christmas Together” imprinted into the glass. Do be sure to buy high quality glasses so they hold up well, and even consider adding a nice bottle of champagne with them as well. f you’re not too close to the bride and groom and don’t want to buy anything too expensive, try buying some upper end glass ornaments. Clear ornaments look the most elite and elegant, much more so than colored. Have their names or initials placed on the ornaments, along with a special date or sentiment of their wedding. Most couples that get married will get several of these, but they’ll always appreciate another ornament to hang on their tree as a reminder of their special day. A pretty pine cone can become a simple place card holder or garland (spray gold for an extra festive feel) amd be used for table decorations and wedding cake decorations. Other cheap and cheerful decoration ideas include gold sprayed leaves, cinnamon and natural greenery. Used spray painted wine bottles paired with pillar candles (Tiger & Ikea are great for cheap candles of all shapes and sizes) to create a cosy, inexpensive winter wedding look. If you have candle holders in your home don't be afraid to mismatch these across your venue too. Add a subtle festive feel to proceedings with a cute and seasonal cake topper. For the ultimate budget option check out our sparkling DIY Best Day Ever Wedding Topper, add some fresh winter fruits covered in icing sugar or a cute festive animal topper. Use these clothing tips for a November wedding! Whether you are the bride or groom or one of the special guests invited to share the sacred day, consider these options before attending a November wedding. Whether you live in Texas or Chicago, a wedding in November is most likely going to be a bit chilly. If you’re shopping for something new, try a rich jewel-toned dress or jumpsuit. Pair your favorite patent leather pointy-toe heels with a deep burgundy or emerald silk dress. The beauty of jewel tones is that they make everyone’s skin glow! If your skin tone is light, opt for a powerful deep blue; if it’s medium, try a sparkling emerald; and if it’s dark, try a ruby red. A smoky brown with a warm gray undertone is also known to look amazing on every shade of skin! Go for a midi- or full-length dress. If you have your heart set on a shorter, flirtier number, grab your favorite pair of tights. They’re an easy solution for a little more coverage during a chilly reception. Play with the opacity and design, and don’t forget to think about the kind of shoe you’ll need to make them work. Fall weddings can be hard to dress for since the weather can be so unpredictable, that's why the most important thing to remember is to dress in layers. For men, try mixing and matching textures and patterns for a cozy look that doesn't look shabby or grungy. Pair a wool coat with a silk tie, and don't be afraid to wear some color! Just look at the invitation for hints of the couple's wedding colors so you don't end up looking like a member of the bridal party. A stylish man can't go wrong with a sophisticated wool suit. This sleek number will get you through any wedding on the bride's best-dressed list. The rumors are true: charcoal is the new black. Dress up using charcoal and you will be good to go. Thanksgiving can be a fun theme to play with at your wedding! We had clients from Chicago who had a "Pie-Stravaganza" in lieu of a wedding cake at their Thanksgiving wedding. Yes, there was fabulous pumpkin pie on the menu, but there were also seven other flavors to choose from. And who doesn't love pie? The size of an out-of-control guest list can be seriously reduced by inviting your friends to spend an important holiday away from their families. Some of your friends won't even consider it. If you can't afford a big wedding but don't want to leave people off the guest list, a Thanksgiving weekend wedding is a great way to get a lot more people to decline the invite. Whether or not you choose to host your wedding at a hotel, out-of-town guests will likely need a place to stay. The fall and winter often means lower rates and has more availability, which usually means all of your wedding guests are able to stay in the same place. This might seem like a pro at first (and some may still consider it one! ), but the fact that Thanksgiving is a truly American holiday means that the entire country will be celebrating. Many families have deep traditions and how they celebrate Thanksgiving is often one of them.By hosting a wedding over Thanksgiving weekend, you're asking your guest to change their usual traditions. Airfares are outrageous for Thanksgiving week. Easily as bad, if not worse, than Christmas and Spring Break. If a lot of your guests will have to travel to your wedding, you have to take that into consideration. Everybody knows Thanksgiving is one of the most heavily-travelled days of the year. Wedding vendors have families too, so don't look for big discounts even if you're getting married someplace that is supposed to be in "off-season, but you'll pay to have them servicing your wedding while their entire family is sitting at home enjoying turkey together. Wedding Favors are one of the few details that are not necessarily a must-have, though they can be a nice addition to your big day. When deciding on whether you should have a wedding favor for your 2018 nuptials or not, think about an item that your guests will really enjoy – something delicious to snack on or music to listen to on the way home – and how much money you can allocate in your budget to it. Edible wedding favors are always in good taste (sorry, couldn't resist! ), and fall is the best time of year to jump on this trend. In-season fruits like pomegranates lend a pop of color to each place setting, while candied apples would delight any guest. Cute bottles of maple syrup or local honey perfectly fit the season. Mini donuts or pie-on-a-stick are surefire hits, and DIY s'mores packages or mix-your-own hot chocolate cones are a sweet treat for guests to take home. Your reception site sets the stage for the entire party. Think about your wedding style, your guest list size and the general mood you want to set as you tour venues. Bring your décor to new heights—literally. The space between the tabletops and ceiling is really being taken advantage of. After all, if you can't build additional square footage onto your reception space, build up! If your wedding theme is more formal, go for tall candles and ornate candelabras. If you want to keep things rustic and natural, bring the outdoors in with leaf-adorned branches. 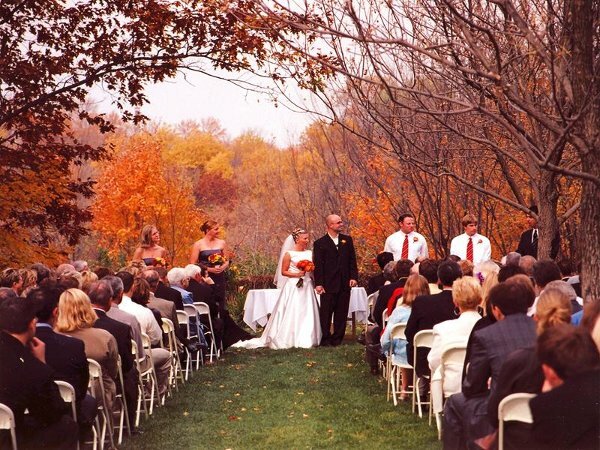 Probably the single most popular fall wedding theme is autumn leaves. After all, if you live in an area that experiences a bright and vibrant fall season, leaves are all around. They can also be a budget-friendly and eco-friendly way to decorate your tables.